Today, April 5th is National Read a Road Map Day! 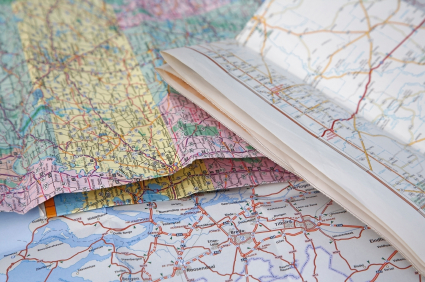 With the advent of Google Maps, Mapquest and the GPS, learning to read a road map is no longer a necessity. But what if your batteries died or the electronics didn’t work. Would you know how to read a road map? My first experience with maps was the globe of the world Mommy had in the living room. Nothing fancy, just a small table top Rand McNally globe that spun round and round. Sitting on the floor, my siblings and I would take turns closing our eyes and placing our finger on the spinning globe ending up on continents and in countries that we would otherwise have never heard about. On trips with Old Roady, I ride shotgun with the map draped across my knees following our route with my finger. I enjoy watching for the next town or turn off. With the purchase of a GPS, my map reading skills are not longer needed, but the activity keeps me awake (I was born with an on/off switch on my bottom that is activated by the seat of a car. ), so I still like to have a map to look at. The last trip we took, I used the Maps App on my iPad. When I realized I was spending more time staring at the little red dot moving along the highway than I was looking at the landscape, I put it away. In my book ‘Out Of The Wilderness’, it was Sophie’s lack of map reading skills that led to her getting lost and in need of rescue. Studying with this tutorial would have saved her from the ordeal. But then, she would have never met Gray. How to use the grid – those numbers and letters bordering the map have a purpose. Where to find the map key or legend and what data is contained there. Why roads come in different colors. What do the different colors and symbols and highway markers mean. The final hurdle in handling a paper road map is learning how to refold it back to it’s original neat and tidy rectangle. For that, there is no tutorial. Do you think map reading skills are becoming a lost art? Do you prefer paper or digital? Posted in Anita K Greene, Author, Inspirational, Paper craft, Travel, Writer and tagged Global Positioning System, Google Maps, GPS, How to, IPad, Map, Mapquest, Maps App, Out of The Wilderness, Rand McNally, Road Map. Bookmark the permalink.